Working in a unique underground fuel depot, acoustic scientists fired a pistol to hear how long the reverb would last. The resulting echo rang on and on and on — completely obliterating the previous record. One minute and 52 seconds. That's the new standard, shattering the previous one — set in 1970 at the Hamilton Mausoleum in Lanarkshire — by an entire 15 seconds. 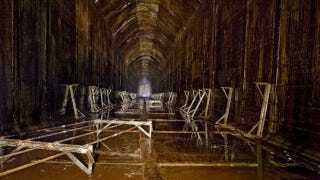 The test was conducted at the Inchindown tunnels located in Scotland near Invergordon. The oil tanks were dug into the hillside in the late 1930s to conceal and protect them from enemy attack, namely the Germans who were re-arming at the time. The tank was designed to hold 6.7 million gallons (25.5 million litres) of fuel and has walls 17.7 inches (45 cm) thick. The space is about twice the length of a football field, 30 feet (9 meters) wide and 44 feet (13.5 meters) high. The shots (which were blanks) were fired by Allan Kilpatrick about a third of the way into one of the massive storage tanks. He works for the Royal Commission on the Ancient and Historical Monuments of Scotland (RCAHMS) and regularly conducts tours of the historic facility. The reverberations were recorded by microphones a third of the way down at the opposite end. "Never before had I heard such a rush of echoes and reverberation," he said. "My initial reaction was disbelief — the reverberation times were just too long."